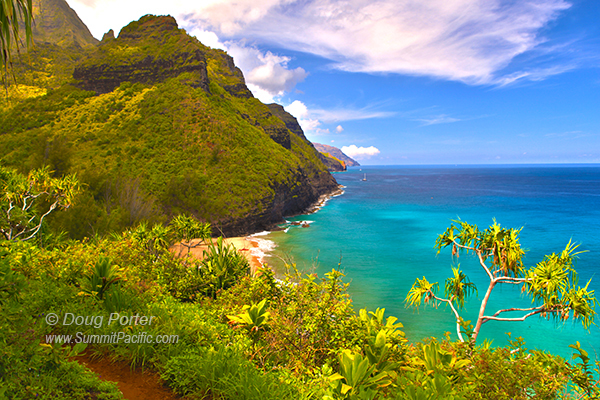 The Hawaiian word "pali" means "steep slope" or "cliff." Na Pali or NaPali means "The Cliffs." Na Pali Coast on the northwestern shoreline of Kauai extends 15 to 20 miles with towering steep sea cliffs rising as high as 3000 feet above the ocean. Because this wilderness is too rugged for roads, it is not possible to drive all the way around the island of Kauai. On the north side of the island, the road ends in a parking lot at Ke'e Beach. Traveling counter clockwise around the island, the road ends at Polihale Beach on westernmost point of the island. (Well, actually the road ends well before Polihale - the last mile or two is unimproved and can hardly be described as a "road.") So although Ke'e and Polihale beaches are only 20 miles apart geographically, driving from one to the other requires a 75 mile trip nearly all the way around the island - a distance that will take well over 2 and a half hours one-way, depending on traffic. The Na Pali Coast has remained unchanged by development and stands today as it has for many tens of thousands of years. (The islands of Kauai and Niihau are about 5 million years old). You can see part of Na Pali from the beach at Ke'e and this is also where the trail along the coast begins. A 30 minute hike up the trail will get you a better view than you can see from the beach. You can also look down from the top of Na Pali from the Kalalau Lookout at the top of Waimea Canyon. Other ways to see Na Pali include boat and helicopter tours, or even kayak excursions. As spectacular as these are, Kauai's pali are not the highest in Hawaii. Those on Moloka'i are even taller and said to be the tallest sea cliffs in the world rising some 3,600 to 3,900 feet above the ocean. 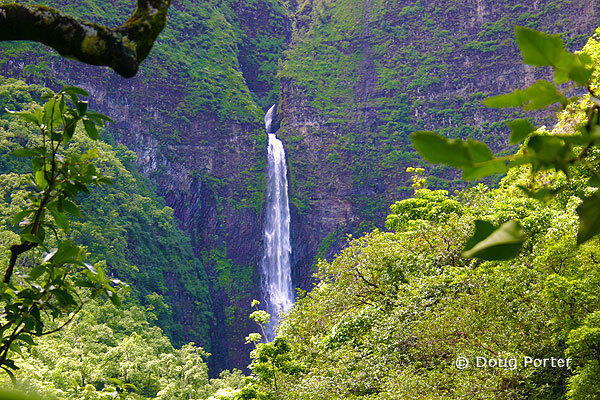 Hiking Na Pali Trail: To see Na Pali properly, to really experience it, you need to hike it. Explore the ancient footpaths, traverse its cliffs, ford its streams, swim under its waterfalls, explore its hidden valleys, beaches, and jungles. This has become increasingly popular as evident by the huge number of cars in the parking lot at Ke'e where the trail begins. However, most of the cars belong to people at the beach or exploring the first mile or two of the trail. Relatively few people hike much further than that. The trail is extremely rugged and steep with many switchbacks. It gets very muddy and slippery and has areas with huge exposure down to the ocean below. The trail continually rises up and down as it makes its way along the coast so when hiking its length you'll also accumulate several hundred feet of elevation gain and loss which adds to the exertion. It is not necessary to obtain a permit for day hikes along the trail although permits are required for camping. This policy changes often however and is enforced sporadically if at all. (more information on permits) The hike to Hanakapiai Beach is 2 miles (one way) and requires a stream crossing just before reaching the beach. Many people have drowned here over the years, some, by being swept out to sea by trying to cross Hanakapiai Stream in high water. Hanakapiai Falls is 2 miles upstream from the beach. Kalalau Valley is 11 miles (one way) from Ke'e Beach. For most people, hiking a few hundred feet up from the trailhead to take a picture is enough.